From now to 30 June 2018, quote ‘Ladyironchef’ upon making reservations to enjoy 20% discount off a la carte menus on weekday dinner and weekend lunch and dinner. This promotion cannot be used jointly with other ongoing promotions at Baan Ying. Baan Ying is conveniently located near Novena MRT station and the 126-seater casual restaurant boasts a modern outlook with door-to-ceiling glass windows. Whenever we hear the word ‘salad’, most of us will dismiss the idea entirely. None of us is massive fans of salads, but boy oh boy, the Thai-style salads at Baan Ying Singapore were so delicious we found ourselves going back for more again and again. The Fried Morning Glory Salad (S$10.80), for example, comprises deep-fried morning glory leaves which are accompanied by a small bowl of minced pork. Scoop up a small portion of piquant minced pork bits and have it with the crispy greens; it was so addictive we went for extra helpings. Other salads to consider are the Wing Bean Salad in Coconut Milk (S$9.80) and Glass Noodle Salad with Seafood (S$9.80). Fried rice on its own is tasty but fried rice with salted egg? Now, that is something worthy of mention. The salted egg yolk chunks gave the fried rice an added bite to it with its crisp texture and complements the fried rice instead of overpowering it. 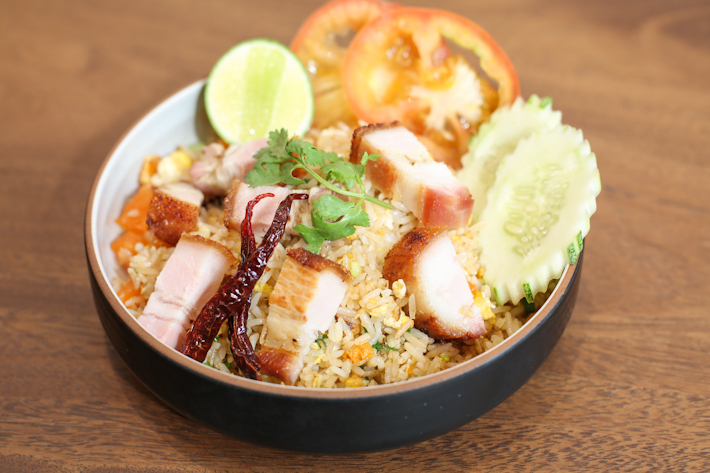 To make it a substantial dish, you can look forward to thick, generous pieces of pork belly lying atop the bed of egg-coated fried rice. Fried rice is a typical street food in Thailand and if you are craving for some authentic Thai-style fried rice, the ideal fiery option for the solo diners would be the Signature Green Chili Fried Rice (S$9.80). Squeeze a few drops of lime juice on the rice and have it with fresh red chili—now that’s how you enjoy Thai fried rice at its finest. 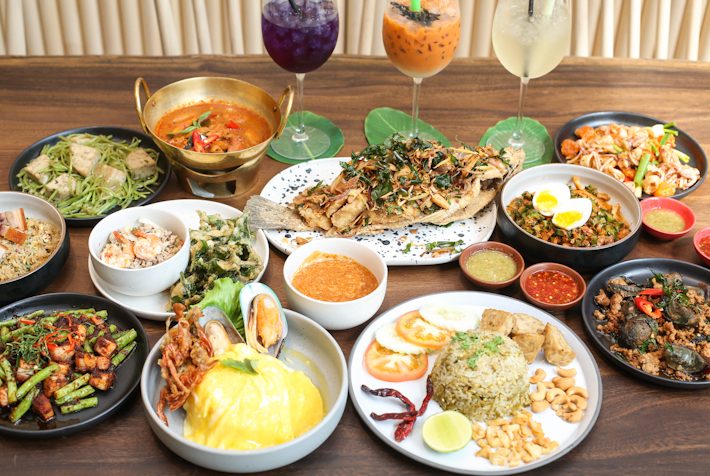 The best part about dining at Baan Ying is that the food can be catered to single diners and even those who are visiting in groups. Some outstanding ones to try are Thai Red Curry with Chicken (S$12.80), Pork & String Bean Stir-Fry (S$9.80) and Century Egg with Minced Pork & Basil (S$11.80). Besides the individual portions, those who are visiting with their family or groups of friends can consider options that are catered for communal dining. For a wholesome dish, the Deep-Fried Seabass with Crispy Herbs (S$32.80) is a crowd-pleaser that cannot go wrong. When it comes to deep-fried seabass, It is important to ensure that the fish remains juicy and moist on the inside while the skin is crispy—which was exactly what we got at Baan Ying. Of course, the addition of herbs heightened the sweet, original taste of the fish. Other family-friendly dishes include Stuffed Squid Steamed in Herbs (S$14.80), Assorted Seafood On Hotplate (S$14.80) and Steamed Seabass with Chili & Lime (S$32.80). Look forward to their seasonal special: Chili Soft Shell Crab and Mussels in Omelette Rice (with Chili Crab Sauce). It was amazing! 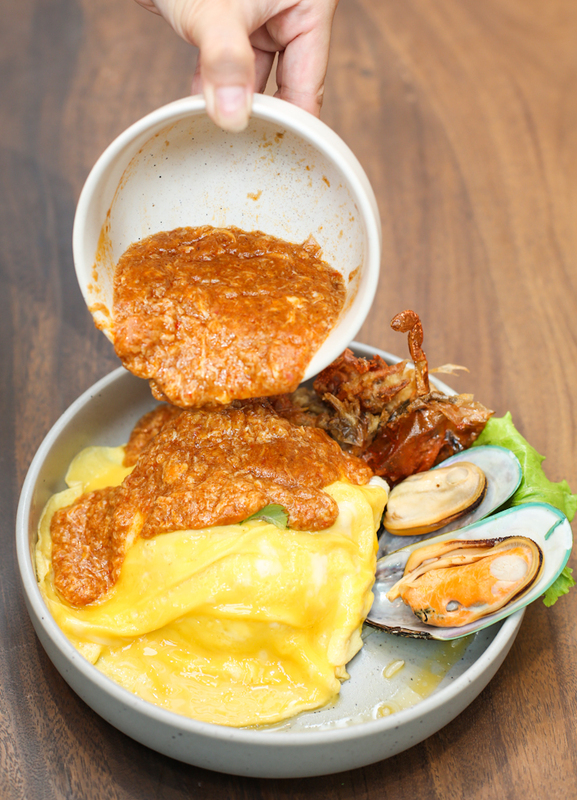 The full-flavoured Thai-styled chilli crab sauce was generously ladled over steaming white rice, then topped off with a well-executed omelette egg that was still runny in the middle. The rich gravy reminded us of Singapore’s iconic chilli crab dish because of the sweet and spicy notes. Yet, they are not exactly similar as the chefs at Baan Ying are more heavy handed with the spice—sticking true to traditional Thai cooking methods. What better way to end off your meal than with some Thai desserts? We loved the traditional Mango With Butterfly Pea Sticky Rice, Rainbow Ruby in Coconut Milk and Home Made Mango Jelly with Coconut & Mango. The restaurant is looking to expand their dessert menu so keep your eyes peeled for what’s to come next! As mentioned earlier, quote ‘Ladyironchef’ upon making reservations to enjoy 20% discount off a la carte menus on weekday dinner and weekend lunch and dinner from now to 30 June 2018. This promotion cannot be used jointly with other ongoing promotions at Baan Ying. This post is brought to you by Baan Ying Singapore. This food is looking so much good and delicious, I want to eat that food, in the nearby future, I also want to take the taste fo that food and enjoy my holidays here.